Jovanovic's methods are oriented towards improving aural awareness, rhythm and musical pitch that produced an extraordinary results in practice. His specific approach at sight singing -a prima vista- is studying four basic diatonic elements: scale movements, 3 jumps, chord movements and jumps larger then 3rd that relates in a systematic manner to all areas of music movement. It includes accidentals, chromatic scales, major and minor scales as well modulation, mutation, etc. It has been noticed that after such training students hear quicker any tonal changes as well as their improved capability to sight sing with ease and more accurate. All the exercises based on Jovanovic's methods are repository on his useful motives that become even more useful trough necessary transposition trough as many keys as possible. His studies are particularly helpful for diatonic modulations that provide the key for solving difficulties in hearing and singing all types of harmonic modulation. His research in developing methods on improving rhythmical abilities is also valuable and well appreciated. Jovanovic's specific teaching of parlato (rhythms' sight reading in the tonal system) is based on the improvised rhythmical groups and patterns on which he published many rhythmical studies and exercises. This is an example from the third book for the third grade of High Music School (for the age from 16 to18 years old). The brackets above the notes shows melodic patterns to be practiced through various scales and rhythms. This is recommended to be practiced before (!) singing whole melodic example. So, "scanning" or analyzing the example is very important. What is interesting about the patterns is that they have some specific melodic or rhythmic figure. In this example, we spot specific melodic figure - diminished third. Through transposition of the pattern through various scales, students become familiar with the melodic figure and they will be able to recognize it in every scale or new melodic example. 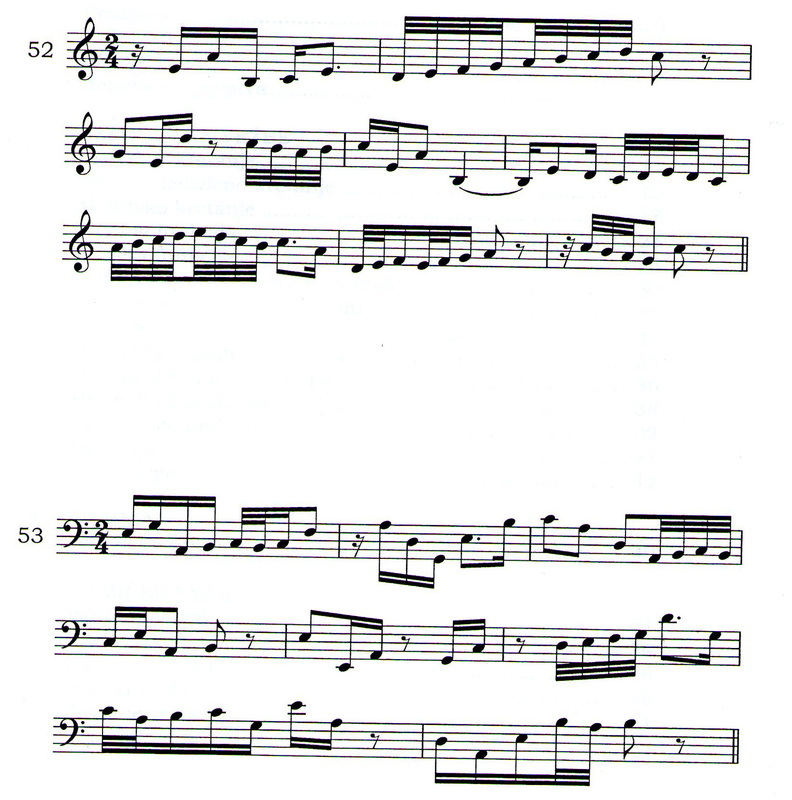 These two examples are rhythmic exercises from the 6th book for the 6th grade student (age 13 trough 15 years old). These exercises are practiced through analysis of the rhythmic figures. Students must recognize the rhythmic figures before they reproduce the example. For example, they must find the syncope, punctuation,variations of the long-short figures and vice versa; they must recognize the measure (two-part or three-part), and tap strictly with right hand or with fingers of the left of right hand; the students can also, instead of saying tones, they can apply the word "ta" on each note; and of course, students are allowed to practice every rhythmic example in various keys (bass, soprano, alto, tenor).